Looking for a higher protein option for a quick breakfast? Striving for diet that is higher in protein is a good idea for people trying to lose weight, those who have PCOS and those who are trying to gain muscle. For many people it’s difficult to find whole foods to meet their protein needs. Avoid protein powders and protein bars by eating more unprocessed protein rich foods. A few weeks ago I was working with a client who is trying to lose weight before an IVF cycle later this year, so we started talking about tofu in smoothies rather than protein powder. This High Protein Fruit Smoothie, which is a combo of frozen fruit and tofu, didn’t quite have the ratio of carbohdyrate to protein that we were looking for, so I advised her to increase the amount of tofu or to add cottage cheese to her smoothie. The next day, I made this smoothie and I thought it was great! Dan thought it was too light and fluffy. Which is encouraging given that the smoothie contains a whopping 25 grams of protein! 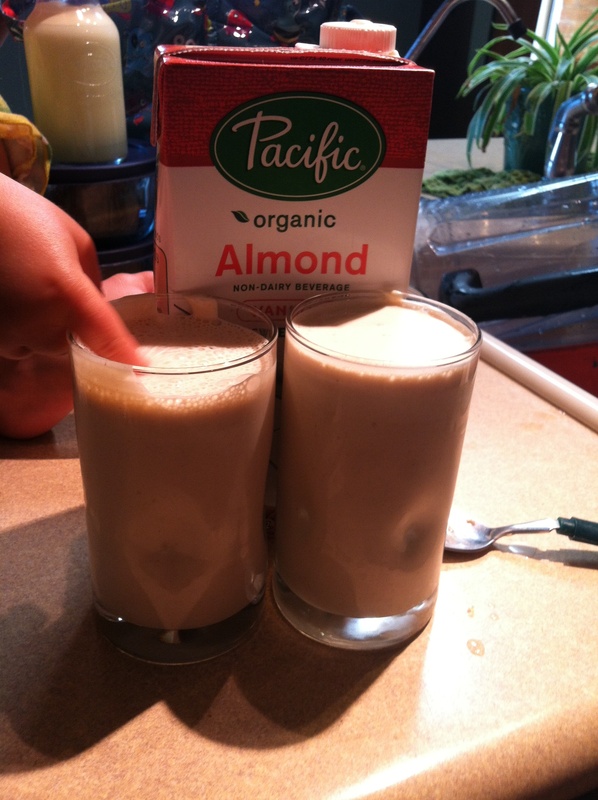 Adjust the ice and amount of almond milk depending on the kind of smoothie you like. Can Your Taste Buds Change? When I first made the smoothie, I thought “this needs some honey”, but I am committed to trying to avoid added sugar, and so I restrained myself. When I made it a second time, again without sugar, it was amazing! The second time I made it, the smoothie tasted “just right”. It’s pea-nutty, and pea-nutty doesn’thave to be sweet. Let your taste-buds experience something different and you will be surprised at how adaptable they are! Place ingredients in blender and process until smooth.